It was fitting that Brad Widdup should win with expensive filly Witherspoon at Newcastle on Saturday. He started the 2018 ball rolling for Hawkesbury trainers by scoring with Witches, ridden by brother-in-law Christian Reith, at Royal Randwick on New Year’s Day and Witherspoon made it 100 for the calendar year. Fellow Hawkesbury trainers Craig Weeding (Chekkapen) and Terry Croft (No Escape) lifted the tally to 102 with Mudgee victories on Sunday. And for good measure, Widdup’s apprentice Qin Ying notched his 10th Australian success by scoring on No Escape. Witherspoon ($1.90) exploded out of the stalls in the 900m Maiden at Newcastle and blitzed her rivals. With Josh Adams aboard, she scored by more than four lengths to finally shed her maiden status after being placed at Listed and Group 3 level at Doomben last December. 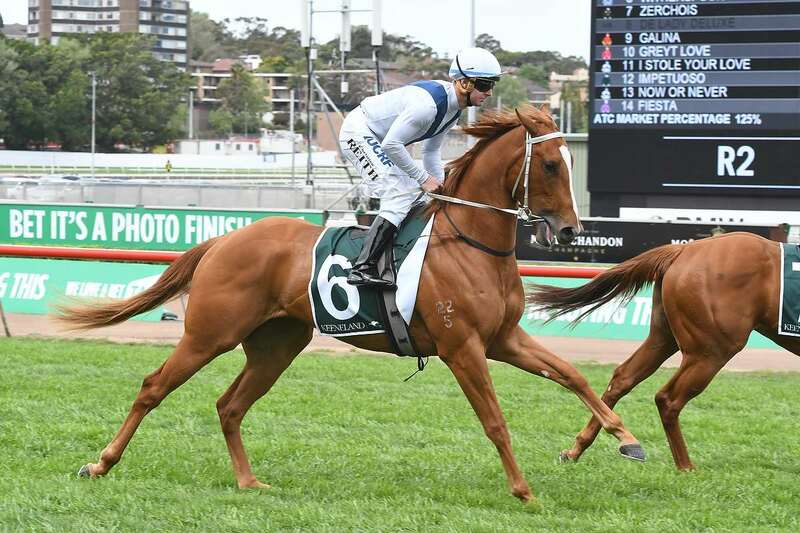 Those races were en route to the Gold Coast’s Magic Millions (1200m) in January, where she suffered interference and finished 13th to another filly, subsequent Golden Slipper placegetter Sunlight. Witherspoon is raced by a ladies’ syndicate, which includes the wives of Widdup’s main client, owner Damion Flower, and well-known rugby league identity Phil Gould. The Exceed And Excel filly was purchased for $500,000 as Lot 50 at last year’s Magic Millions Yearling Sale at the Gold Coast. She is a younger half-sister to three-year-old Taking Aim (last year’s Ken Russell Memorial 2YO winner at the Gold Coast and now racing in Hong Kong with John Moore) and four-year-old Manuel (a five-time winner for Tony McEvoy in South Australia and Victoria). Taking Aim and Manuel fetched $520,000 and $240,000 respectively as yearlings. Widdup is taking a short break and will confirm Witherspoon’s next target when he returns. But it may be the Rosebud Prelude (1000m) at Royal Randwick on July 21, which would be her last start as a two-year-old. The Prelude winner automatically secures a start in the $150,000 Listed The Rosebud (1100m) at Rosehill Gardens on August 11 for early three-year-olds. Witherspoon was Widdup’s 47th winner in an outstanding first full season of training, and his 52nd overall. Meanwhile, Croft has another country target in mind for No Escape ($4.40 favourite), who clinched the fifth win of his 24-start career, in the Alfabs Cup (1400m) at Mudgee. The five-year-old is being aimed at the $30,000 Forbes Cup (1600m) on August 6. No Escape won a 1400m Class 1 Handicap at the same meeting last year. Apprentice Qin Yong’s 3kg claim proved invaluable at Mudgee as No Escape carried only 51.5kg and thus had a decisive 9.5kg advantage over a gallant runner-up All Summer Long ($6.50). Croft’s five-year-old is now unbeaten from two starts on the Mudgee track, having also scored over 1400m there on May 19. Young Hawkesbury trainer Craig Weeding is doing a splendid job with Chekkapen who, like No Escape, made it two wins from his last three starts by landing the Benchmark 54 Handicap (1600m). An $11 chance and ridden by 2kg claimer Jamie Gibbons, the four-year-old beat another $11 shot Butter Toast and No Escape’s stablemate Colonial Reign ($6). Chekkapen won a 1300m Maiden at Bathurst on June 3 before finishing a close second in a 1450m Class 1 Handicap at Quirindi on June 23.